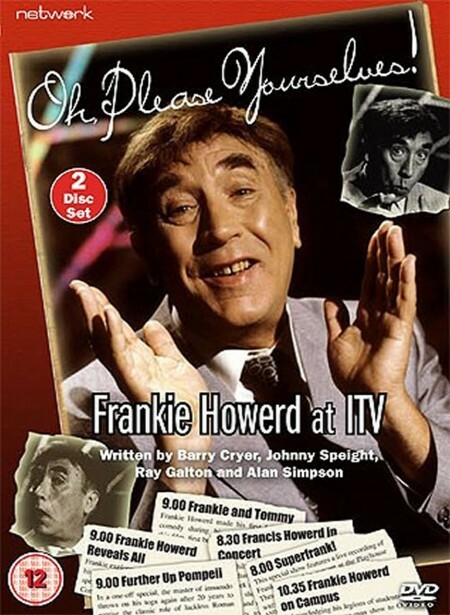 Frankie Howerd's risqué jokes, double entendres and meandering anecdotes firmly established as a national comedy treasure, with his television performances gaining huge ratings over nearly four decades. Some of his most successful shows were produced for ITV, and included here are six shows which reflect the ever-broadening appreciation of his comic genius – from the hugely popular variety shows of the seventies to the enthusiastically received routines on Britain’s university campuses during the early nineties, confirming Frankie Howerd’s status not only as a comedy icon but a cult hero embraced by a generation of young student aficionados. With writing from Johnny Speight, Galton and Simpson, Barry Cryer and Vince Powell, this marvellous collection presents Frankie at his finest. Frankie entertains British troops in Northern Ireland. Mid-70s Light Entertainment, with guest star John Le Mesurier. Frankie live in concert at Weston-Super-Mare. Featuring the master of innuendo in concert at Oxford University. The irrepressible Lurcio rises again! SPECIAL FEATURES: Two interviews with Russell Harty (from 1974 and 1979).